The first long-term, real-world study on carcinogens in e-cigarettes has found that they are significantly safer than smoking. The study by UCL's tobacco research group found that smokers who switched to e-cigarettes had significantly lower levels of tobacco-specific nitrosamines (TSNAs), and volatile organic compounds (VOCs) released by smoking and associated with cancer. But those who smoked alongside vaping or used a nicotine replacement therapy like a patch maintained their TSNA and VOC levels. Such was the conclusion of Nicotine, Carcinogen, and Toxin Exposure in Long-Term E-Cigarette and Nicotine Replacement Therapy Users: A Cross-sectional Study, which was published in the Annals of Internal Medicine. Some public health campaigners have succeeded in prohibiting e-cigarette products, viewing them as equivalent in harm to smoking. Australia last week reaffirmed its ban on e-cig products, on the basis that it "normalises" smoking, and the evidence of harm from vaping is absent. This attitude got an earful from Professor Robert West, one of the study's authors and head of the UCL's tobacco research group. Wariness of new nicotine technologies "spills over into a general ethical view about anything that isn't the pure way of stopping smoking," he told The Times. Dr Clive Bates, former head of anti-smoking group Action on Smoking Health, pointed out on Twitter that the ban simply grants tobacco companies "exclusive access to Australian consumer nicotine market". He blames a "mutually-reinforcing embrace between hyped-up activist junk-science and clickbait metrics driving incentives in journalism" for misleading the public. Although anti-vaping campaigners have been active, succeeding in prohibiting e-cig use in Wales, they haven't been decisive. Last May, Ernst & Young found that the UK had the highest adoption of vaping out of seven countries studied. It found the proportion of ex-smokers who vaped was rising as the proportion of "dual-use" smokers and vapers was declining. 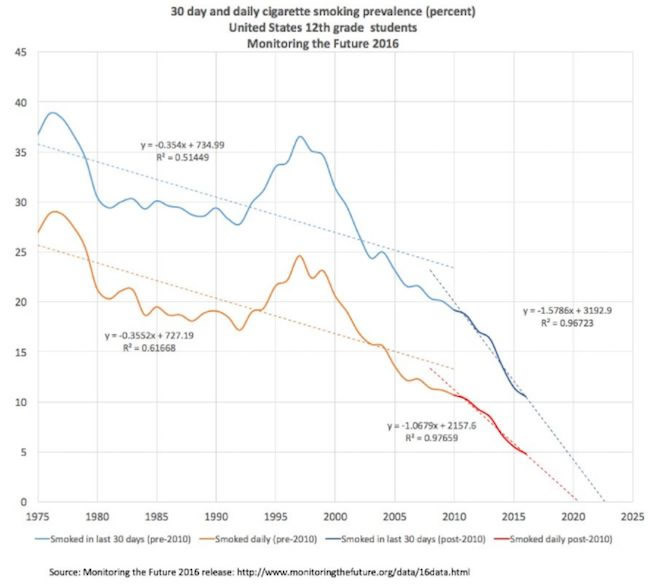 E-cigs have also resulted in a steeper decline in teen smoking.